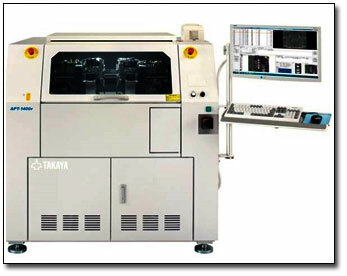 We are proud to now support Flying Probe Testing using the latest generation Takaya APT-1400F. The new architecture provides unprecedented test speed: 30% to 50% test time over the Takaya 9411 models. The completely upgraded XY stage of the APT-1400F, combined with the positioning accuracy from its enhanced optical system, provides up to 50% improvement in probing accuracy over the market leading APT-9411. Four flying heads and Six Z Mechanisms in addition to the four standard moving probes. Highly Accurate Measurement System includes three 4 Quadrant sources and measurement systems with 16-bit ADC/DAC and AC Programmable generator. Strong and Rigid XY Stage made from highly polished granite to achieve faster moving speeds with a 25% improvement in positional accuracy. Ultrafast Test Speed with the use of new technologies test is speeded up by up to 50%. Improved Optical Test System gives AOI functions including color, LED, Missing, wrong orientation, positioning error, Barcodes and 2D Barcodes, OCR and Library and Real Map. User Friendly Software with the aim to cut down your programming time.